Freddy: It is not up to you to decide what happens here. 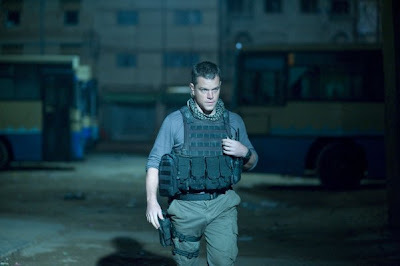 GREEN ZONE marks the third time actor, Matt Damon, has worked with director, Paul Greengrass. Their previous work on the second and third “Bourne” films must have been pretty mind blowing because Damon has since vowed never to reprise the role that brought him international fame unless Greengrass is at the helm. This action pairing is a new Hollywood powerhouse or at least that’s what Damon and Greengrass would like to think and what the studio is selling. Just like the weapons of mass destruction that are being sought out in the movie though, these claims are based on false intelligence. Perhaps if Greengrass had not kept Damon running up and down dark alleys all the time, he might have been able to see that the premise of GREEN ZONE had already been brought to light years ago. Damon plays Miller, an army chief on mission to locate WMD’s in the weeks following the U.S. invasion of Iraq in 2003. Shockingly enough, he does not find any and Miller, being the super soldier that he is, figures out that there must be something wrong with the intelligence if he keeps coming up empty handed. He then decides to take matters, and by matters I mean the entire Iraq war, into his own hands and figure out why the U.S. is there to begin with. You may not believe this but the conspiracy involves the C.I.A., the press and the American government. Maybe if Greengrass hadn’t given instruction to the entire cast to yell at the top of their lungs most of the way through the film, he would have heard how dated the script was. How is accusing the American government on film of fabricating reasons to invade Iraq innovative at all? 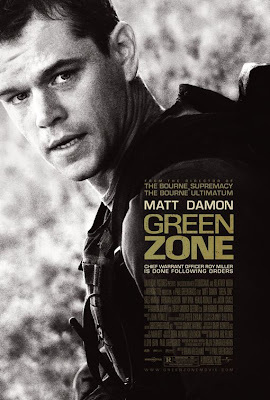 I almost wanted to laugh at how serious GREEN ZONE takes itself, as if it truly believes it is making a brave point. The laughter stopped pretty quick though and then turned to anger. This is not a brave point. This is exploitation of a now mainstream acceptance of how America duped the world. Brave would have been saying this years ago. Pretending to be brave is just plain cowardly.